Wedding planners are usually the first thing on the budgeting list to go, but what if they could actually save you some dollars? 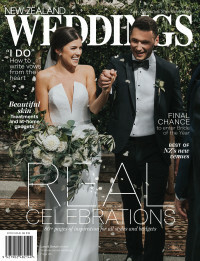 After a few years working in the hotel industry, Nicolle Hannah found her niche in events and in particular – weddings! Now with her own events planning company based in the Bay of Plenty, we chat to Nicolle about all things wedding planning and discover a gem of a venue in Rotorua. Prior to starting her own business, Nicolle Hannah Wedding & Events Specialist , Nicolle worked in a number of hotels before finding her niche in the events department. After growing as much as she could within the four walls of the hotel, she took a step into the unknown and began her journey at Collective Hospitality, one of the largest catering companies in Auckland. Here she went from coordinator to sales manager, learning everything from planning, delivering and executing phenomenal events and it was here that she found her passion for weddings and helping couples work towards the biggest day of their lives. Below, we chat to Nicolle about her business, a gem of a venue and her advice for couples tying the knot. You've recently moved from Auckland to Rotorua, right? Can you tell us about NH Events and how it came about? Being raised in Rotorua means as much to me as my love for my job. A few years ago the Bay of Plenty was calling me and I left the rat-race of the big smoke behind. Finding the right job in the Bay of Plenty was difficult after the position I had held in Auckland and nothing seemed quite challenging enough for me – this prompted the beginning of NH Events! I knew there was nothing like it Rotorua, yet there is so much going on in the region so I took a courageous plunge and here we are today, nearly two years later. NH Events is built up of the following services – all aimed around the same theme: To ensure my clients have a seamless and enjoyable event planning journey. Couples on a tight budget might completely write-off having a wedding planner – why do you think wedding planners so valuable? Most people have never organised an event in their life – suddenly, they’re engaged and they have the most important event to plan for and deliver without a hitch to all of their friends and family – that’s a pretty overwhelming thought and it is so important that you don’t feel alone throughout the process. I totally get it, weddings are expensive, so often the wedding planner is one of the first on the list to go. A lot of people don’t realise that by having a wedding planner on-board, it can actually save you money by having great vendor relationships, knowing where to get the best bang for your buck and not to mention they can save you stress and time. These days, there is so much information out there! The number of vendors, options and advice is overwhelming, which makes it really difficult to know where to start. By having a planner at your side you’ll know that you are being steered in the best direction and it saves the endless emails, googling and wondering if you are on the right track. If a full planning package isn’t an option on a budget, a virtual planner can be a great alternative to ensure you’re on track. Speaking of virtual planning packages – can you talk us through the different packages NH Events offers? I offer a range of packages from virtual planning, onsite coordination through to full planning options. Depending on the location of your wedding and how much involvement is required, a full proposal would be prepared. I do have standard packages as a guide, but no two weddings are the same, so it is important we ensure the service is right for you and your day. All these packages are listed on my website. You work with Longfords Estate . If a couple was booking this as their wedding venue, could you talk us through the process you’d go through with them when planning? Yes! Longfords Estate is a fantastic hidden gem located on a working farm at Lake Okareka, just 10 minutes shy of Rotorua. I manage this beautiful property exclusively, so this means when a client books Longfords Estate, my services are included! At no extra charge, our clients at Longfords will have expert advice right throughout the planning process including budgeting/planning and preparation for the day, supplier advice and support as well as the full support of a venue coordinator on the day of the wedding. Can you tell us more about Longfords Estate? Longfords Estate is a magnificent privately owned property nestled on a working farm near Rotorua. We have a stunning outdoor ceremony location which has a backdrop of Lake Okareka in one direction, native bush to your right and rolling farmland on the left – all elegantly surrounding the gorgeous country brick home. Couples love this site for the endless photo opportunities and the ‘exclusive’ feel that the property has. The permanent silk-lined marquee is equipped for smaller groups or for up to 200 guests seated on our oval tables – all looking out at the picturesque Lake Okareka. What do you love about working in the wedding industry? Any tips or advice you could give to couples in the midst of planning? Working in the industry is just so rewarding! Together with my clients and other fantastic industry creatives – we all have the same common goal – to make a couples day the best it can possibly be! There is nothing better than to hear that I have made a couple’s day as seamless and as stress free as possible. If I were to give one piece of advice to a couple that are in the midst of planning and are feeling a little overwhelmed, it would be to ask for advice. There is no room for error in event management and it is so important to ensure you have dotted the I’s and crossed the t’s. If a planner isn’t an option for you then ask the people around you – friends, family and of course the suppliers that you have booked in so far. To find out more about the talented Nicolle Hannah Events email her at [email protected] , visit her website or follow her on Facebook and Instagram .